is found when we serve without notice and give without recognition. We empower and inspire in our family of God. "Filipino Canadian Catholic Charismatic Prayer Communities (FCCCPC) is a Charismatic Organization comprising of different prayer communities duly recognized and authorized by the Magisterium of the Archdiocese of Toronto. 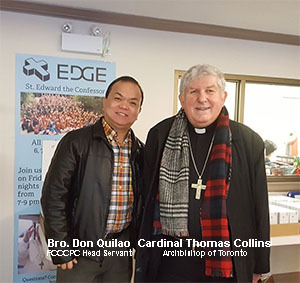 FCCCPC is an Active Member of the Alliance of Filipino Catholic Charismatic Prayer Communities, Canadian Catholic Renewal Council, Archdiocese of Toronto Charismatic Renewal, Archdiocesan Filipino Catholic Mission (AFCM) and the Archdiocesan Council of Lay Organizations." When faced a certain amount of trials, tribulations and most specially test of faith, how do we overcome them? Bro. Bob Canton said, "I went through a trial by a mile". To review the events, here are just a few emails forwarded to us in May 2014. One thing goes on, with the continuous and relentless intercessor from friends of renewal, prayer warriors and the family, prayers can do wonders and we look at the recovery there is hope. His testimony shows once again that with God, nothing is impossible at all! A Catholic Christian in Jerusalem, Israel who was born blind when Bob Canton and the congregation prayed over him, miraculous healing of that blind man begun to see. Sophia Golde Lathrop, Ca. U.S.A. shared with you great news about her daughter. Bob Canton prayed over her daughter Delila about 4 months ago during the Mass and Healing Service at St. Luke Parish. She and her husband have been trying to have a baby for quite some time now. We found out Dec. 11 that she is about 5 or 6 weeks pregnant. Praise God. Thank you, Bob for your prayers. It is one of the best Christmas gifts from the Lord for our family ever. We, at the Filipino Canadian Catholic Charismatic Prayer Communities (FCCCPC), are very proud of your accomplishments and we thank the Lord for giving us leaders in their caliber. I thank you for your healing service in the FCCCPC Grand assembly and for your wonderful teachings. His testimony is really touching, and it shows once again that Jesus works in wonderful ways. FCCCPC Grand Assembly 2018 organized by the Filipino Canadian Catholic Charismatic Prayer Communties, Ontario, Canada on August 25 2018 at the Korean Canadian Cultural Association. It was soul-elevating and gave a heavenly experience that stirred over 500 faithfuls. The theme of this event was "Transforming in Christ". As I think about sharing God's promise of renewal, I remember FCCCPC's Vision To help strengthen and deepen the faith of the Filipino Christian communities. Bro. Don Quilao, Head Servant of the FCCCPC said "Let us praise and thank our Lord & Saviour Jesus Christ, one with God the Father and the Holy Spirit, for the bequest of gifts & vocation in our communities during the 2018 - FCCCPC Grand Assembly. It is always appropriate all these gifts to the Glory and Honour of God the Father in Heaven and for further unity among us." Bro. Bob Canton, National Coordinator of The Alliance of Filipino Catholic Charismatic Prayer Communities (AFCCPC) stated, I am also touched by the cooperation of exhibited by everyone(I would like to name all of you but I believe you know it's not practical for me to do so) including all volunteers and everybody who were involved in the planning of the Grand Assembly and contributing their precious talents, and time, and efforts to serve in any area they were needed. Praying the Pleading of the Precious Blood of Jesus makes positive results. It converted many not only physical, emotional and most of all spiritual transformation. So many testimonies we rarely post most, but here are a few from just what our delegate witnessed this FCCCPC Grand Assembly 2018. To learn more browse below. 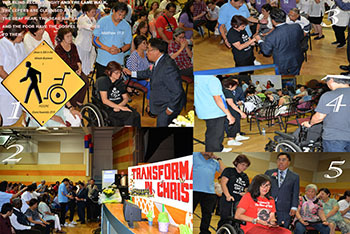 Jesus is Still in the Miracle business - One highlight in the FCCCPC Grand Assembly 2018 was a handicapped woman walked in faith. 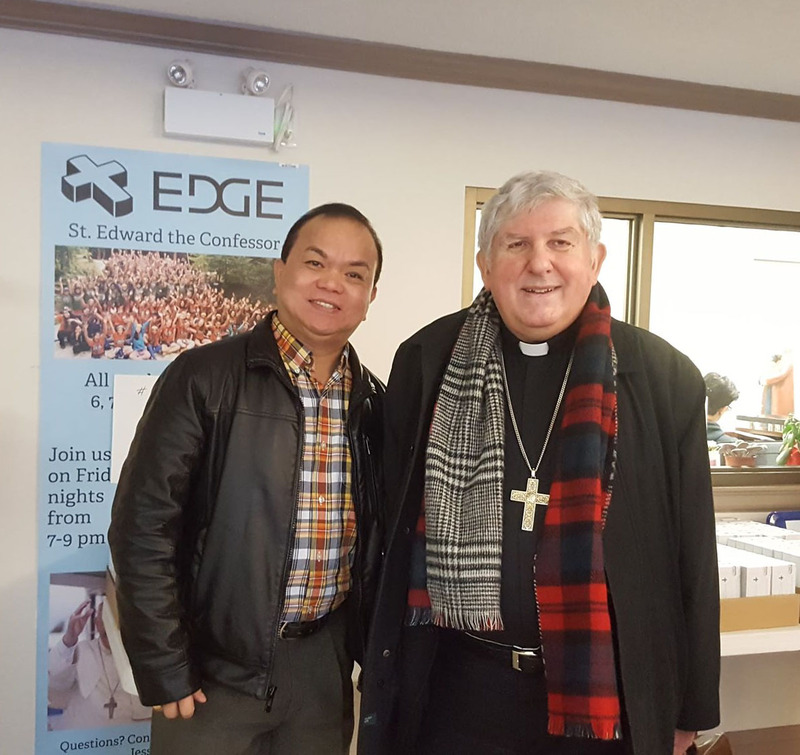 The Filipino Canadian Catholic Charismatic Prayer Communities (FCCCPC) in Toronto, Ontario, Canada invited Bro Bob Canton to talk about the Theme Transformation in Christ. (Please click above picture - Testimony of Sis. MaryBelle Jose). 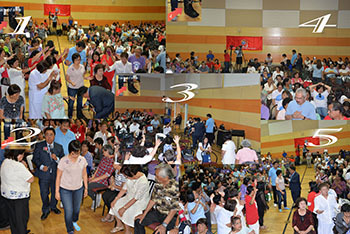 The number of healing experiences and salvation has been amazing and grows every hour during the Filipino Canadian Catholic Charismatic Prayer Community (FCCCPC) in Toronto, Ontario, Canada on August 25, 2018, at the Korean Canadian Cultural Association. We are witnessing, a delegate whose swelling, bruising ankle and are too painful and unstable to walk on around the hall. She walked with ease and no pain encountered. Truly, Jesus is still in the healing business. To God be the glory!!! We the FCCCPC is one FAMILY OF God WORKING TOGETHER to make more & better disciples of Jesus Christ. We are thankful of our God and your prayers for we have 46 Servant’s Leaders from our member community. Don Quilao, our Servant Leader and an International Speaker talked on the core content on Discipleship and Leadership. Deacon Bob Rosales presented the Magisterium of the Church and testified his conversion as one member of the highest place in serving God. Last, Fr. Ben Ebcas Jr., despite a hectic schedule on his Parish in Our Lady of the Assumption Church he discussed about Discipleship and Leadership in the doctrinal point of view. After the group session, each group was thankful about the Seminar, it paved the way of a good relationship with God and relationship with each other. God's message given through St. Faustina to the world to turn to His mercy is reminder to trust the Divine Mercy in Jesus and seek His forgiveness. And as Christ is merciful, so, too, are we instructed to be merciful to others. The message of Divine Mercy has become an integral part of Catholic faith, including the celebration of the Feast of Divine Mercy on the Sunday after Easter. Miracles still do happen today. 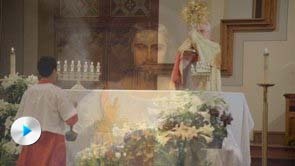 The Toronto Archdiocesan Lay Associations, Movements & Organizations took place on December 1, 2018 from 9:00 am to 1:45 pm at the St. Edward The Confessor Parish, 75 Churchill Avenue, North York. Lately, we have seen our volunteers behind the scene, Brothers and Sisters who bring light to the success of the FCCCPC Grand General Assembly 2018. So often we take our volunteers for granted. For this we would absolutely recognize their work in conducting things running smoothly. Many communities don't even know the names of the ones supporting each of us in a wide variety of ways. We've had the advantage having volunteers from all representatives' communities who invest in an incredible amount of activity to make sure that our members receive an appropriate during the event. For those who welcomes our delegates, register them and prepares all requirements. These are the ones who make the magic happen and keep the bus a-rolling. For we will present our delegates how delighted they are and enjoyed the fellowship to all members. The Lord Is My Shepherd Prayer Community.